Make your day sweet with Nestle Kitkat and get free amount of credits inside it. Paytm is promoting their newest offer known as Paytm Kitkat Offer for all Paytm Users. You just have to buy a Kitkat pack from your nearest shop which contain information about the offer on the wrapper. Now there is a Paytm Kitkat Cashback Coupon code or cash code which is printed inside the pack. This cash code is helped us to provide free Paytm cash. We can use this Paytm cash for further recharges, shopping, bookings and in many places. This is not it as the best part of the offer is that you can use the same offer 3 times through your same account during the offer period. Enjoy the sweet and soft Kitkat and the offer from Paytm. Buy Nestle Kitkat thrice and Use this offer 3 times to take 100% benefit of the offer. Offer valid from 1 February 2016 to 30 April 2016. 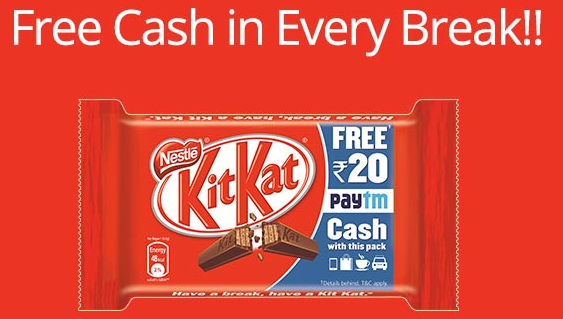 You need to visit this link https://paytm.com/kitkat to redeem your free patym cashback code. We provide you some steps which help you to grab the offer. 1. First purchase a pack of Kitkat from the shop which contain notification about the offer on the outside of the wrapper. 5. Now click on “Submit” button. 7. You can use the cashback for recharges, shopping, gifts etc. 2. Paytm coupon code or cash code is valid till 30 April 2016. After that you will not get any kind of credit from the coupon. 3. Offer is valid from 1 February 2016 to 30 April 2016. 4. You can use these cashback for recharges, shopping, bookings, gifts etc. 4 Responses to "Paytm Kitkat Offer – Purchase Nestle Kitkat and get Rs. 10 or Rs. 20 Paytm Cash"